A new poll by Quinnipiac in Colorado reports that incumbent Democratic U.S. Sen. Mark Udall holds an insignificant +1% lead over GOP challenger Cory Gardner in the U.S. Senate race, 45% to 44%. A new poll by Gravis Marketing in Kentucky reports that incumbent GOP Sen. Mitch McConnell holds a solid lead over Democratic challenger Alison Lundergan Grimes in the U.S. Senate race, 43% to 36%. Other recent polls have reported a considerably closer race. A new poll by Mason-Dixon reports that Democrat Charlie Crist and incumbent Republican Governor Rick Scott are tied in the race for Florida governor, 42% to 42%, with Libertarian Adrian Wyllie at 4%. Why Are Poor Americans Poor? TX Governor: Is It Close Or A GOP Romp? A new poll by Rasmussen in Kansas reports that incumbent Republican US Sen. Pat Roberts holds a significant lead over potential Democratic challenger Kathleen Sebelius, 54% to 37%. A new survey Public Policy Polling in Texas reports that Republican Greg Abbott leads Democrat Wendy Davis in the race for governor by double-digits, 51% to 37%. A new poll by Florida Insider of 120 of the state's "most plugged in politicos" finds that 74% think former GOP Gov. Jeb Bush will run for president in 2016 but just 32% think Sen. Marco Rubio will do so. A new survey by Public Policy Polling in New Hampshire reports that incumbent Democratic Sen. Jeanne Shaheen lead Republican challenger Scott Brown in the U.S. Senate race, 49% to 41%. Another survey by WMUR also shows Shaheen leading 45% to 39%. Control of US Senate: A Red Flag For Democrats In NC? A new SurveyUSA poll in North Carolina reports that Democratic US Sen. Kay Hagan now trails all five possible Republicans she might face in her re-election race this year. In this must win state for Democrats, are Hagan's numbers a red flag? A new poll by Monmouth University/Asbury Park Press n New Jersey reports that 52% believe that the newly released internal probe into GOP Gov. Chris Christie's administration and the Bridgegate scandal was intended to "to help Chris Christie's reputation." A new poll by Reason-Rupe reports that 75% of Americans think all politicians are "corrupted" by campaign donations and lobbyists. 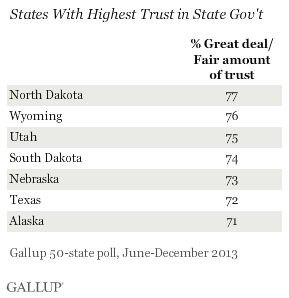 The Most and Least Trusted State Governments? 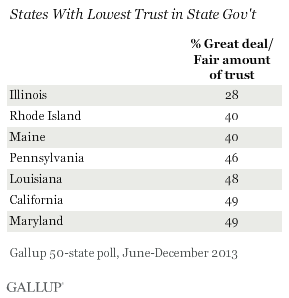 A new Gallup poll reports that Illinois tops the list for state residents with the lowest trust in their state government: “llinois’ position at the bottom of the list … is not surprising, given that its last two governors, Rod Blagojevich and George Ryan, were sentenced to jail for crimes committed while in office.” Here is Gallup's chart for the most and least trusted states. According to a poll by new Marquette Law School in Wisconsin, incumbent GOP Gov. Scott Walker leads Democratic challenger Mary Burke in the race for governor, 48% to 41%. Democrats can take comfort in this year's US Senate race in Virginia. A new poll by Quinnipiac reports that the incumbent Mark Warner leads Republican Ed Gillespie by double-digits, 46% to 31%, with Libertarian candidate Robert Sarvis at 6%.